SAN ANTONIO, Texas – Consider it the most productive season by a quarterback in Pac-12 Conference history. 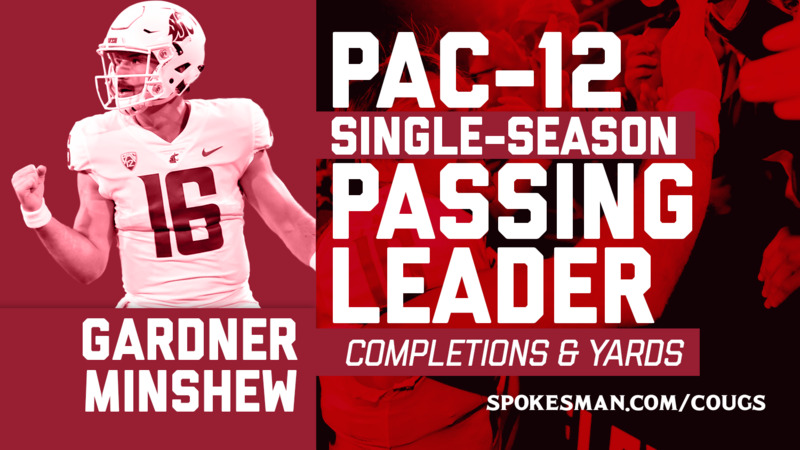 Thirteen games after throwing his first pass for Washington State, Gardner Minshew has become the Pac-12’s career passing leader, usurping former Cal and current Los Angeles Rams quarterback Jared Goff for the top spot. The previous mark of 4,714 yards was set by Goff during the 2015 season. Minshew, the fifth-year graduate transfer from East Carolina, needed just 238 yards to set the new record and did so on his 29th in Friday’s Alamo Bowl against Iowa State in San Antonio. The record-breaker came on a 20-yard flip to Tay Martin in the fourth quarter of WSU’s 28-26 win over the Cyclones. The Brandon, Mississippi, native also broke the WSU single-season record, set in 2013 by Connor Halliday. Minshew came into the Alamo Bowl with 4,477 yards on the season and needed only 121 to break Halliday’s school record. The QB broke the record on a 5-yard slant to Dezmon Patmon in the second quarter, two plays before his 7-yard rushing touchdown. Patmon skies high to pull down the ball and give @WSUCougFB another 6️⃣. A handful of other passing records went down Friday in the Alamo Bowl. In the second quarter, Minshew broke the Pac-12’s single-season completions record with his 450th of the season, beating the conference record of 449 previously held by Halliday. Later in the quarter, the WSU quarterback matched Luke Falk’s single-season school record for passing touchdowns with his 38th of the year. Minshew tied that record with his 9-yard throw to Patmon in the back of the end zone. Published: Dec. 28, 2018, 9:19 p.m. Updated: Dec. 31, 2018, 9:50 a.m.